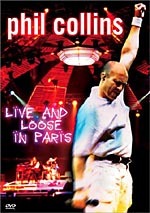 An eight hour DVD featuring Phil Collins' performance from Paris that formed part of the year's Final Farewell Tour. If you’d told me two years ago that I’d shell out $100 and drive 300 miles round-trip to see a Phil Collins concert, I’d have laughed at you. As I’ve noted in other concert DVD reviews, I have absolutely no aversion to traveling for concerts, but I usually hit the road for a select few acts like Bowie and Springsteen. I’d not seen Phil Collins or purchased an album of his since 1990, so he clearly wasn’t one of my favorites. Things change, and due to my gig as a DVD reviewer, I re-developed some interest in Collins’ work. I saw the DVDs for Serious Hits… Live! and Live and Loose in Paris, and they reminded me that I liked Collins’ music once upon a time. I dug him during his Eighties heyday but bailed in the Nineties. These DVDs rekindled my moderate affection for his material. However, it’s a big jump from “moderate affection” to “driving 300 miles for a $100 concert”. Collins’ 2004 “First Final Farewell Tour” was his first full American jaunt since 1997, and despite its glibness, I took the title seriously. Apparently Collins developed an ear injury that makes live performance risky. Although folks like Cher and the Who have made a mockery of the “farewell tour” concept, I think Phil means it, so I wanted to see him one more time while I still could. As I noted, I’d not seen Collins live for 14 years, but he presented a fairly similar kind of show as in the past. 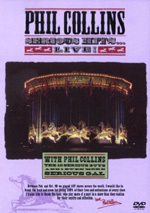 Without a new album to promote, Collins pushed this as essentially a “greatest hits” concert. That meant a span of songs from his entire career. From 1981’s Face Value, we find the hits “In the Air Tonight” and “I Missed Again”. 1982’s Hello! I Must Be Going offers his cover of the Supremes’ “You Can’t Hurry Love”, while “Against All Odds” emanates from the soundtrack from the 1983 film of the same name. “Easy Lover” comes from a 1984 collaboration with Earth, Wind and Fire’s Phillip Bailey on the latter’s Chinese Wall. When we get to 1985’s smash No Jacket Required - the definitive peak of Collins’ solo career – we discover “Don’t Lose My Number”, “One More Night”, “Sussudio” and “Take Me Home”. Also from 1985 we get the single “Separate Lives”, while both “Two Hearts” and “A Groovy Kind of Love” stemmed from 1988’s Buster soundtrack. 1989’s ...But Seriously presents “Another Day In Paradise”, “Hang In Long Enough” and “Something Happened On the Way to Heaven”. Off of 1996’s Dance Into the Light, we get the title tune plus “Wear My Hat”. Collins covered Cyndi Lauper’s “True Colors” for a 1998 single and greatest hits release, while 1999’s movie soundtrack Tarzan throws out “You’ll Be In My Heart”. 2002’s Testify is Phil’s most recent full-length studio album, and it gives us “Can’t Stop Loving You”, “Come With Me” and “It’s Not Too Late”. Finally, “No Way Out” comes from Phil’s work on 2003’s Disney flick Brother Bear, and “Drums, Drums and More Drums” only exists as a live piece. The show’s opening moment presents its nadir. “Drums, Drums and More Drums” isn’t a proper song. Instead, it starts with a Collins drum solo, and then drummer Chester Thompson answers. The pair soon play at the same time, and eventually percussionist Luis Conte joins them. This goes on for almost eight and a half minutes and starts the show on a self-indulgent note. Perhaps given the concert’s career retrospective attitude it makes sense, as it reminds us of Collins’ origins as the drummer in Genesis. However, it launches the concert poorly; I know when I saw Collins in person, I thought the tedious drum solo was a bad omen. Happily, the show picks up immediately with the punchy and catchy “Something Happened On the Way to Heaven”, and it manages to flow fairly smoothly after that. Actually, the first DVD occasionally drags a little, as it favors Collins’ slower fare. Sure, we get lively numbers like “Heaven”, “Don’t Lose My Number”, “Hang In Long Enough” and “I Missed Again”, but more subdued songs take the forefront for the concert’s initial half or so. That’s what I felt when I saw the show in person, as I thought it could be somewhat slow-going until “In the Air Tonight”. After that, it cranks along quite nicely. “Air” continues to sound terrific live, and the concert rarely sags the rest of the way. Even not-so-memorable tracks like “Dance Into the Light” and “Wear My Hat” benefit from the greater energy and come to life well. Not that this should be construed to indicate that the concert’s first half becomes a snooze-fest. Actually, those portions fare better on DVD than in the arena. The slowness doesn’t seem as glaring sitting in a comfy chair opposed to standing up in a crowded hall. I suppose it’s a good thing that the show picks up in its second half, as that makes sense. You don’t want to satiate the audience earlier, and this one builds a good head of steam. The DVD definitely replicates the concert well. When I saw that Hamish Hamilton directed it, I got a bit nervous, as I wasn’t too satisfied with his takes on shows from U2 and Madonna. However, he restrains himself here and stays with a natural, concise depiction of the action. That means a calm and logical take on the performers. We get an obvious focus on Collins himself, but the action spreads to give us a good look at the band members, and the occasional crowd shot works just fine. Hamilton doesn’t dally in one spot for long periods, but he also avoids excessively rapid cutting. Hamilton doesn’t turn this into a tremendously evocative visual production, but he reproduces the source material with taste and restraint. The same goes for the performances. Collins has worked with many band members for quite some time, and that history pays off with tight renditions of the songs. Guitarist Daryl Stuermer proves especially effective, as he brings out some edge to songs that previously lacked much toughness. As for Phil, he’s not quite as animated and chatty as in the past, but he still manages to hold the stage well. He sounds good, as his voice holds up well throughout the show and demonstrates very little sign of wear. It’s too bad that Collins’ hearing issues make it uncomfortable for him to perform, as he continues to put on a solid show. Phil Collins is a fairly pedestrian musical artist, as he never threatened to reach the greatness occasionally touched by colleagues like Peter Gabriel and Eric Clapton. However, this shouldn’t detract from a long and fruitful career that produced a nice body of pop tunes. Collins isn’t and never will be one of my favorites, but I enjoy his music and think this concert DVD presents him in good form. 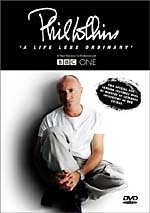 Phil Collins: Finally… The First Farewell Tour appears in an aspect ratio of approximately 1.78:1 on this single-sided, double-layered DVD; the image has been enhanced for 16X9 televisions. A high-quality presentation, Finally looked terrific from start to finish. Sharpness looked very precise and detailed throughout the show. The image came across as crisp and distinct, and I saw almost no signs of softness. This was a rock-solid picture that usually offered strong visuals. I noticed no signs of jagged edges, moiré effects or edge enhancement in this tight presentation. Source flaws and digital artifacting also seemed totally absent. Colors appeared warm and rich. The show featured a fairly natural palette with subdued lighting, and these tones all came across with excellent intensity and detail. The hues seemed very lively and crisp. Black levels were also nicely deep and dense, while shadow detail appeared appropriately heavy but never excessively thick. Overall, the picture seemed very impressive, and Finally stands as one of the best-looking concert DVDs I’ve seen. And the audio was just as good. Finally presented both Dolby Digital 5.1 and DTS 5.1 soundtracks. The two seemed quite similar, and I noticed nothing to clearly differentiate one from the other. As one expects from a concert presentation, the soundfield remained anchored in the front, where it showed outstanding stereo imaging. Phil’s vocals appeared firmly set in the center, while the various instruments were accurately located and they demonstrated nice breadth and delineation. The instruments were placed in a natural and clear manner. They also blended together smoothly to create a forward soundstage that consistently created a real and involving setting. As for the surrounds, they largely offered a general sense of ambience. Mostly I heard crowd noise from the rears, as those speakers didn’t do a whole lot of obvious work. Occasional instances of light percussion and popped up in the back, but mostly we got hall-filling reverb and cheering. They supported the music and made the presentation come across as natural and distinct. Audio quality sounded solid across the board. Phil’s vocals demonstrated a vivid presence that put them strongly out front. He always appeared appropriately natural and accurate, and the clarity of his singing was impressive. The rest of the track also showed fine warmth and a dynamic tone. Instruments remained crisp and vivid during the concert. Bass response seemed generally deep and rich, and highs were clean and bright. The various components appeared crisp and the entire presentation provided a vibrant and lively piece of work. I could stop there and I’d recommend Finally, as it presents a good concert with solid picture and sound. However, the set’s supplements put it over the top as an excellent release. Spread across both discs, we find 21 music videos. We get videos for almost all of the songs. Only “Drums, Drums and More Drums”, “Come With Me” and “It’s Not Too Late” fail to present these clips, and that’s just because no videos exist for those tracks. Most of the videos are pretty ordinary, but a few fun ones stand out from the crowd. Probably the best of the bunch, “Don’t Lose My Number” neatly parodies the excesses of Eighties music videos. It spoofs a few movies and also gets in digs at videos by the Police, the Cars, and Elton John. It’s a blast. A few videos feature multiple Phils, and all are entertaining for different ways. The earliest, “I Missed Again” gets by just due to its novelty. Phil performs as all the band members, though he air-plays all the instruments. “You Can’t Hurry Love” makes Phil the male equivalent of Diana Ross and the Supremes, as he sings both lead and backup in this amusing piece. “Two Hearts” not only casts Phil as all four members of a Sixties combo, but also it gives him distinctly different looks as the various characters. It’s the most entertaining of the multi-Phil videos and delights enough to let me ignore the inevitable Buster film clips..
What else works? Parts of “In the Air Tonight” look cheesy and dated, but the video’s simplicity and ominous tone match the song well. Based on its premise, “Hang In Long Enough” isn’t quite as much fun as I’d expect, but it’s fairly clever. Set in 1912, it casts Phil and band as performers on the “SS Udio” and watches them as they dazzle the crowd and go down with the sinking ship. “Wear My Hat” offers a predictable video, as it essentially just acts out the song’s lyrics, but it’s still fun and it tosses in a cute cameo from Danny De Vito. The inclusion of hot babes - a rarity in Phil videos - doesn’t hurt. Finally, “Take Me Home” is cool just because it’s so geographically ambitious. Obviously shot in spurts while on tour, it shows Phil in many different locations around the world. It’s a simple lip-synch clip, but it’s neat to see Phil show up in so many different spots. Note that Finally doesn’t act as a compilation of Phil’s videos. If the song doesn’t appear in the concert, the video isn’t part of the package. I admit it would’ve been nice to find the smattering of missing videos as well, but given the generousness of the set, I won’t complain. A few scattered live performances from over the years also appear in this set. Omitted from the Live Aid boxed set, we get Collins’ second take of the day for “Against All Odds”. His London version shows up in the Live Aid package, but this Philadelphia rendition only appears here. That makes it a good bonus, though it probably should have been part of the Live Aid DVD. If you click on “Wild Card” from the screen for “Separate Lives”, you’ll find a Montreux Jazz Festival performance of “Pick Up the Pieces”. Text explains that this 19998 clip comes as part of a tribute to Atlantic Records founder Ahmet Ertegun, and the song lasts forever. I don’t think it’s a very interesting version of the song, but it makes for a nice addition here. From the 1981 Secret Policeman’s Other Ball, we locate the live solo debut of “In the Air Tonight”. Actually, it’s not totally solo; Phil plays piano along with acoustic guitar accompaniment. It alters the song a lot from the more dramatic album version, though, and it’s an intriguing reworking of the song. A few of the songs include multiple camera angles. We can watch “Drums, Drums and More Drums” and “Easy Lover” from three different angles, while both “Come With Me” and “Wear My Hat” offer a pair of angles. I always like the opportunity to check out the action from different perspectives. This set offers pretty limited chances to do so, but I still enjoy them. A few longer programs appear. A Bit of a Parking Problem runs 17 minutes and 45 seconds and presents an unusual look behind the scenes. “Superintendent Walter Strange” - played by Phil - investigates a complaint about bad parking. This sends him around the arena as he chats with various members of the concert production crew. I can’t say we learn a ton about the way they mount shows, but it’s amusing and a clever way to take us into the subject. For a more conventional look at things, we go to the 30-minute and five-second Finally… The First Documentary. It presents concert clips, behind the scenes glimpses, and interviews. We hear from Collins, manager Tony Smith, guitarists Daryl Stuermer and Ronnie Caryl, drummer Chester Thompson, bassist Leland Sklar, percussionist Luis Conte, keyboardist Brad Cole, backing vocalists Arnold McCuller and Amy Keys, production manager Steve Jones, personal assistant Danny Gillen, trumpeter Harry Kim, wardrobe manager Eileen Licitri, tour promoter John Giddings, and director Hamish Hamilton. 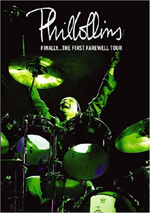 The program covers the scope of the farewell tour, selecting which songs to play and the concert’s structure, the band and the crew, rehearsals, Phil’s personal involvement in the concert program and the show’s visual production, costumes, traveling, reflections on various gigs and choices of where to play, shooting the DVD, and saying goodbye. It doesn’t offer a great “nuts and bolts” look at the tour, but it covers the basics well and proves entertaining. I especially like the discussion about making the DVD and what compromises Phil was willing to make. Overall, the documentary moves quickly and fills us in on some fun details. Phil’s Flash Gallery includes a collection of 38 stills. These cover shots from concerts. It’s a fairly dull roster of pictures. A tremendously odd piece, At Last… The Long Lost Network TV Special was shot during the 1990 tour. It’s not a tour documentary, as it instead combines only a few clips from the road. Instead, it purports to look at ideas for a Phil Collins TV special. We meet TV executives played by Jeffrey Tambor, Weird Al Yankovic, Gilbert Gottfried, Vanessa Williams, and Eddie Gorodetsky. They constantly meet with Phil and bandy about different concepts for the show. We also find guest appearances from John Travolta, Bruce Willis, Henry Mancini, Don Johnson, John Candy, Barbara Mandrell, the Ultimate Warrior, rappers Doctor Dre (the fat one from MTV, not the one from NWA), Ed Lover and T-Money, and Al Kooper. ”At Last” operates as parody from start to finish, and to my shock, it’s actually sporadically amusing. I never thought I’d say that about a show that uses Paul Shaffer as the voice of a talking dog, but the whole thing aims to attack TV and it throws out some fairly nasty barbs. Phil gets stuck in a variety of awkward musical situations. He does a big band ballad “In the Air Tonight”, a rap version of “Don’t Lose That Number”, a country “Separate Lives”, an Elvis ’68 Comeback take on “One More Night”, and coffeehouse Dylan rendition of “Another Day in Paradise”. We also see him get the bejeezus beat out of him in a wrestling match accompanied by “Two Hearts” and the “Hang In Long Enough” video intercut with shots of the TV executives as they discuss it. None of this ever threatens to turn into brilliant comedy, but it’s an entertaining oddity. Lastly, the package includes a 12-page booklet. It mostly presents concert photos, but it also gives us tour and DVD credits and some notes from Phil. The booklet doesn’t prove terribly useful, but it’s a nice addition. One helpful touch: all of the documentaries come with subtitles in a variety of languages. Will his “First Final Farewell Tour” really stand as Phil Collins’ goodbye to the concert stage? That remains to be seen. I hope not, for he still exhibits a good stage presence and the ability to entertain. Finally offers a solid show, with a nice career overview of songs played well. The DVD presents very positive picture and audio with a startlingly terrific roster of extras. We get alternate angles, many music videos, additional live performances and a mix of documentaries in this stuffed package. One of the best concert DVDs I’ve ever seen, Finally earns a glowing recommendation.